(Nanowerk News) NASA’s MAVEN spacecraft has provided scientists their first look at a storm of energetic solar particles at Mars and produced unprecedented ultraviolet images of the tenuous oxygen, hydrogen and carbon coronas surrounding the Red Planet, said University of Colorado Boulder Professor Bruce Jakosky, the mission’s principal investigator. “Everything is performing well so far,” said Jakosky of CU-Boulder’s Laboratory for Atmospheric and Space Physics. “All of the instruments have now been turned on, and although they are not yet fully checked out, they are functioning nominally. A solar flare on Sept. 26 produced a CME that was observed by NASA satellites on both sides of the sun. Computer models of the CME propagation successfully predicted the disturbance and the accompanying SEPs would reach Mars on Sept. 29. The hydrogen and oxygen coronas of Mars are the tenuous outer fringe of the planet’s upper atmosphere, where the edge of the atmosphere meets space. In this region, atoms that were once a part of carbon dioxide or water molecules near the surface can escape to space, according to MAVEN scientists. Water and carbon dioxide control the climate, so following them allows scientists to understand the history of Mars over the last four billion years and to track the change from a warm and wet climate to the cold, dry climate present today. 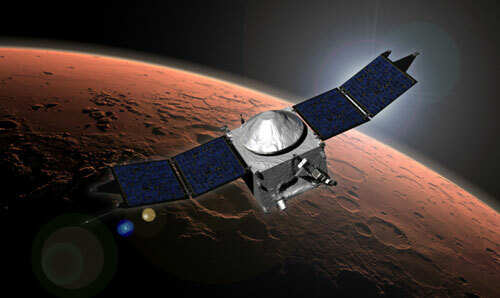 MAVEN observed the edges of the Martian atmosphere using the CU-Boulder-built Imaging Ultraviolet Spectrograph (IUVS), which is sensitive to the sunlight reflected by the atoms. IUVS also helped scientists create a map of the atmospheric ozone on Mars by detecting the absorption of ultraviolet sunlight by the molecule. “With these maps we have the kind of complete and simultaneous coverage of Mars that is usually only possible for Earth,” said CU-Boulder Research Associate Justin Deighan, an IUVS team member from LASP. “On Earth, ozone destruction by refrigerator CFCs is the cause of the polar ozone hole. On Mars, ozone is just as easily destroyed by the byproducts of water vapor broken down by ultraviolet sunlight. There will be about two weeks of additional instrument calibration and testing before MAVEN starts its primary science mission. This includes an end-to-end test of relaying data between NASA’s Curiosity rover on the surface of Mars and Earth using the MAVEN mission’s Electra telecommunications relay. The mission is aiming to start science in early to mid-November. CU-Boulder provided two science instruments and leads science operations, as well as education and public outreach, for the MAVEN mission, which has contributed roughly $300 million to Colorado’s economy. UC Berkeley’s Space Sciences Laboratory also provided four science instruments for the mission. NASA’s Goddard Space Flight Center in Greenbelt, Md., manages the MAVEN project and provided two science instruments for the mission. Lockheed Martin of Littleton, Colo., built the spacecraft and is responsible for mission operations. NASA’s Jet Propulsion Laboratory in Pasadena, Calif., provides navigation and Deep Space Network support, as well as the Electra telecommunications relay hardware and operations.